Watercolor painting options are pretty much infinite, but when it comes to watercolor brushes they are of two major types. These are synthetic bristles and the natural ones. Of course, there are fans of each type for different reasons, but neither type is better than the other one. This is because whether you are strictly a natural brush user or synthetic, both have their pros and cons. But choosing which brush to use depends on its preference based on availability, effectiveness, comfort, price and also your belief as a painter and as a person. So the best way to find out which one you prefer is to try each and decide which one works best for you. Natural brushes. As the name implies, the brushes are made of materials found in nature. This includes animal hair and fur from goats, squirrels, and boars. It is said that natural brushes are able to hold pigment a little better than synthetic brushes. Natural brushes are perfectly soft although they have the tendency to shed and the tend to be more expensive. Natural brushes are mainly the best when it comes to holding more water and have longer watercolor strokes. As they give a sheerer application. Natural brushes are quite difficult to wash unlike synthetic ones. Also, they can pose a threat to people with allergies because the bristles are made from animal hairs which can cause a bad reaction. The natural brush mostly include Kolinsky sable which is a Siberian weasel, which is hunted for its fur and tail hair is used for brushes. But is worth keeping in mind that brush brands specify what kind of material their bristle are made from. Synthetic painting brushes are well made of synthetic bristles usually hand-crafted out of materials like nylon and polyester. Sometimes they get dyed to look like natural brushes. 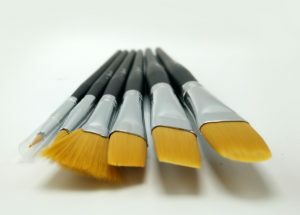 As far as application goes, synthetic brushes are used for all artist mediums such as watercolor, acrylic, gouache and oils paints. However, they do a good job simply because they are easy to wash, not expensive, and have similar features as natural ones. 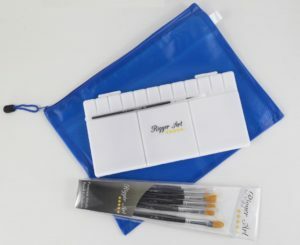 Get a painters bundle pack which includes 6 professional brushes + travel palette + mesh bag and carry your art stuff nice and neat anywhere you go (see image). Synthetic brushes are not quite soft as the natural ones, but are much cheaper and comes in many brands and style. They do not absorb as a lot of pigment as the natural brushes, but for most painters this is not an issue. Dipping the brush once or twice to add paint, is something most painters do not even notice. Many painters are animal lovers, they love nature and wildlife. They must know that in order to make the natural hair brushes, these animals must be hunted. They are caught and skinned so their fur and hair could be sold to brush manufacturers. This is one of the advantages of synthetic painters brushes, they are made of man-made materials, they are totally cruelty-free. 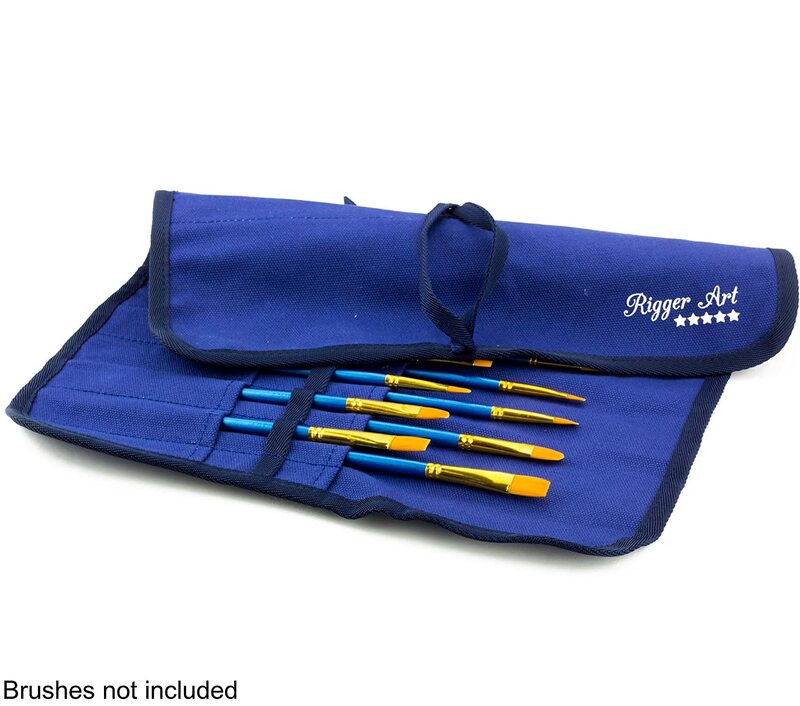 Brands like our Rigger Art make exclusive synthetic brushes. The Painter’s bundle pack has 6 professional synthetic brushes included! This entry was posted in Painting Brushes, Videos and tagged Acrylic Brushes, PaintBrush Shapes, Paintbrushes Set, painting brushes, Rigger Art Brushes, Watercolor Paintbrush by RiggerArts. Bookmark the permalink.